A premier planned mountain golf community, The Coves at Round Mountain will provide all the luxury and amenities its members are after, with the seclusion and beauty that can only be found in the Carolinas. More than anything, however, this prestigious golf community in Colletsville, N.C., provides its residents with a lifestyle packed with activity options, while being secluded enough to maintain a family atmosphere. 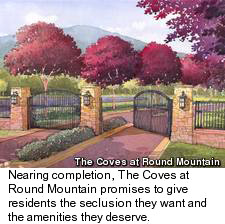 When it's completed, The Coves at Round Mountain will be home to just 1,750 residences. And while residents will be close to large cities to provide any big-city needs, the Round Mountain community will be packed with options for those looking to lead an active lifestyle. Because The Coves is a golf community built into the natural landscape like few others, and residents get to enjoy not only man-made fun, but fun that only nature itself can bring, as well. For golfers looking for the perfect homestead to combine family life and the sport of their choice, The Coves at Round Mountain delivers full force. The Round Mountain Golf Club will be an 18-hole signature championship course designed by three-time U.S. Open champion, and golf course architect, Hale Irwin. 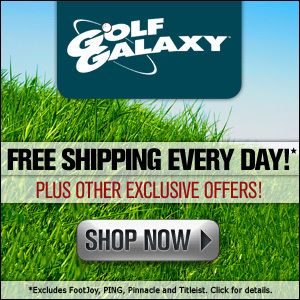 It will give golfers all the challenges they could want and more. "When searching for a course name, we kept going back to the highest elevation point in the development, Round Mountain. 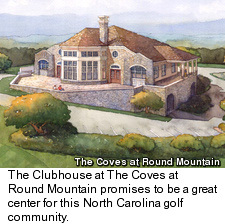 We feel this reflects our plans for The Round Mountain Golf Club to be one of the top courses in the area and a pinnacle for golf course living in North Carolina," said Tim Ritch, managing partner of the Archer Group, which manages The Coves. "The Coves is a very special and unique mountain community." If golf isn't your thing, The Coves at Round Mountain provides a plethora of choices when it comes to amenities and activities. Residents interested in communing with nature will have at their disposal scenic monuments such as The Blowing Rock, Table Rock Mountain, Lake James, Grandfather Mountain, Pisgah National Forest, Linville Falls and Linville Caverns all within an hour's drive or less from their homes at The Coves. Also, for residents who ski, mountain resorts such as Appalachian Ski Resort in Blowing Rock and Beech Mountain Ski Resort are less than an hour from The Coves. On-site amenities at The Coves will include a large mountain lodge that both acts as a golf clubhouse and a community center. Swimming pools for adults and children will be available, as will a state-of-the-art fitness center and wellness spa, as well as dining options. Other athletic activities at The Coves at Round Mountain will include unlimited mountain biking and hiking opportunities, as well as canoing and kayaking on the nearby Johns River and nearby Wilson Creek. Tennis and other activities will also be available. While it's the golf, activities and luxurious family atmosphere that catches peoples' eyes when they see The Coves at Round Mountain, what really grabs people is the opportunity to become a resident of this golf community and take advantage of the large lots where they'll have freedom to live the way they've always dreamed. 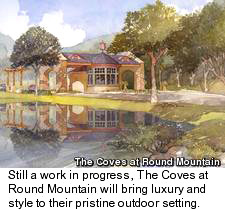 The Coves at Round Mountain offers buyers an inspired selection of home site options. Homes include incredible views of the surrounding mountains and pristine Carolina landscape. Residents can choose from home sites that are mountain peak, ridge top, panoramic view, riverfront, on the fairway and many other spectacular locations. Lots come in sizes from one acre to five acres and have elevations ranging from 1,100 to 1,650 feet. Once a resident has purchased a home site, they can pick out the builder of their choice through The Coves Custom Builder Program and get the design for their dream home. 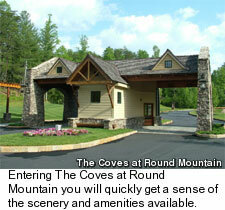 Prices for home sites at The Coves at Round Mountain can range from as little as $70,000 to as much as $400,000. "These home sites are a unique part of The Coves at Round Mountain and represent some of the best property available in western North Carolina," said Bruce Dickinson, general manager of The Coves. There are new winds blowing in the North Carolina golf community market, and with the addition of The Coves at Round Mountain, select residents will have the opportunity to enjoy all the golf, activities, amenities and privacy that this top-quality golf community can bring.